--A new adaptation of Amethyst based on the 5th edition (5E) of the first fantasy roleplaying game, the defining RPG of the last, current, and most likely next generation. 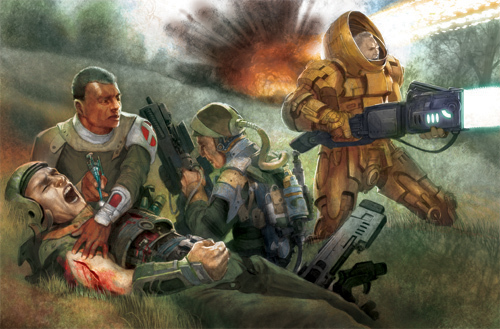 --New technology-based rules including vehicle combat and firearms compatible with any 5E game. --Eleven new races and over thirty new backgrounds. --Eight new classes based around technology. Over thirty new archetypes. --High Tech Equipment from revolves to railcannons. Powered armor. Both ground vehicles and aircraft. The Gunslinger gets "two one-handed small arms, $300 or less". Is that $300 total for both, or $300 each? Is this essentially an update of "Amethyst Compendium (4E)" to 5E mechanics? Does "Amethyst Compendium (4E)" contain any non-4E specific things that aren't included in "Amethyst: Quintessence (5E)"? There can never be a perfect replication of 4E to 5E, but yes, Quintessence is an adaptation of Compendium. Does 'Magic' exist , and can it be removed to make this a hard sci fi setting game. Not saying I wouldnt use this , but I like the idea of a hard sci fi . It can, absolutely, but you are more advised to use Ultramodern5 instead. Hey Chris I'm trying to perches the book but whenever I proceed to checkout it says to enter the card verification number all It shows is a check box and no place to place the verification number. I would love to buy your book but the site will not let me and appears to be broken somehow. That's a website issue. I would switch to another browser, or clear your internet cache via CCleaner. Also, make sure (if Windows) you have all your updates done and reboot your PC. If the website is still prompting the message, email OneBookShelf tech support and perhaps it is an issue they can fix. What is the difference between "Amethyst: Quintessence (5E)" and "Ultramodern5 (5th Edition)"? "NeuroSpasta (5E)" says one of these two is needed but recommends "Ultramodern5 (5th Edition)" and I'm wondering why. They are similar, though Quintessence is designed for fantasy settings while UM5 is designed for non-fantasy settings. So if your cyberpunk game has some element of fantasy to it, use Quintessence. Is there overlap in content between "Amethyst: Quintessence (5E)" and "Ultramodern5 (5th Edition)"? Like, is there a point to buying both? There is overlap...but there is also considerable original content in each as well. Is there a point to buying both? Quintessence has the setting and the magical integration. It also has races and monsters and such. Ultramodern5 has more rules, more mechanics, and two adventures. is there an adventure inside ? Quick question about the martial artist if you don't mind. The combo chain says in the end note that you can use a weapon but use the table damage instead of the weapon damage. If you use a weapon do you have to use the table damage progression or can you use the weapon damage and still build combo? The rule specifies that you must use the damage dice values on the table to take advantage of the "combo chain" and "finishing move". That being said, if someone wishes to wield a low-damage dice weapons like a D4 or D6 weapon, I would have no issue using that weapon's damage dice, except that that dice value would not increase like the combo chain table states; you would still be able to take advantage of the finishing move. 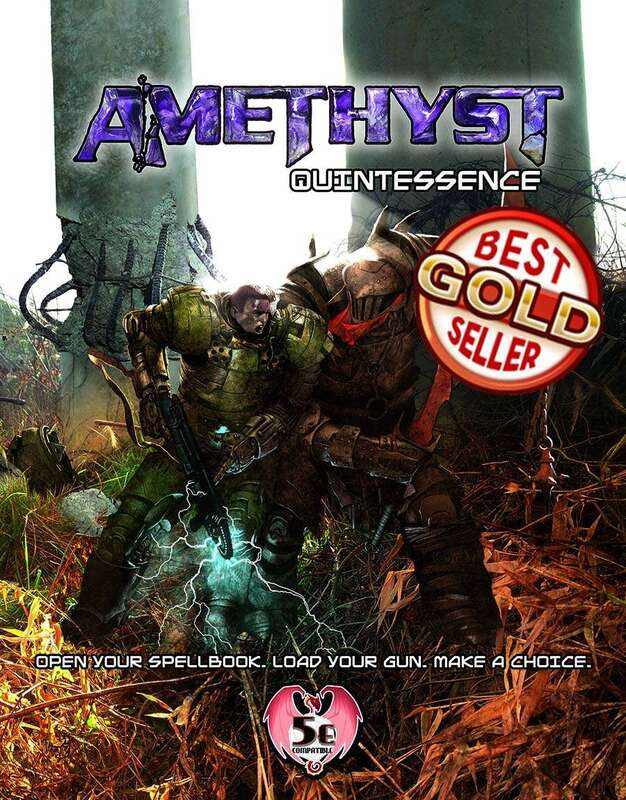 Why fire arms weapons in amethyst Quintessence 5e (and Ultramodern5 ) has such low damage? For example fire arma in D&d DMG has double damage die. The damage output of firearms is meant to pair more accurately to other weapons in the game and to be balanced to 5E classes throughout 20 levels of play. The weapons in the DMG are not intended to be used in modern games with characters at 1st level—they are included as rare items in a D&D game. To pair well with 5th Edition philosophy, the increased damage output with weapons occurs with classes, so it’s misleading to just refer to the weapons table for the total damage output of firearms. As said, this is in line with 5th Edition philosophy—for example., the rogue does significantly more damage using a dagger via sneak attack then a cleric using a dagger. The same applies with modern classes. What a sniper can do with a sniper weapon is far more than what a normal person can do. Since the firearms in D&D’s DMG have no class synergy, their damage outputs are higher. In effect, the damage of firearms in Quintessence and Ultramodern5 are not reduced at all. Question, are there any options for the stubborn few who might refuse to believe that there's no way of mixing the chaos of fantasy with the order of science? Those who may very well foolishly and likely wrongly believed that the two can mixed, putting themselves between the two conflicting sides. If not, would such individuals be forced to live a short existence of failure, scorn, and maybe even madness? Despite the seemingly hard divide, there are means for the two to coexist in limited ways. Low TL is less susceptible to disruption but all tech can be protected for short periods of time. My own campaign is about a person who strived for exactly what you say, and the consequences of what he achieved. Interesting, is there any chance you could give me information on how you handled the idea in your campaign? If you would prefer, we can do private message so as to not spoil it for others. Also was that bit about Ixindar a joke or serious? Great ideas Luke--My games have all been about mixing as well. Sometimes by choice, sometimes forced. I love the idea of characters crossing the threshold by force or by choice...when by force, it's because the players asked before hand--choice by players, forced onto characters. Email didn't have an expiration date noted. Was there an expiration for this? Must have been. Contact me directly and I'll forward you a specific coupon. Yes, it will be a independent file. Should the Mobile Motor Armour have Enhanced Str? It seems like it should have Str 23 given the Gauntlets it has. Ta. I was going along with the Str for other Mobile Armours which seem to be either 23 or 25 in most cases. I agree that 18-20 sounds much better. Are you interested in handing out any review copies? I have been doing a lot of 5th edition reviews, and am interested in this title. Message my directly and I'll see what I can do. Question on widgets: with the hard cap of 5uc of widgets per day to build items under Engineering it seems like high technology is going to be too long to build in most games even with a PC with a high Engineering skill, many widgets, and a high TL engineering kit. Techies get at least 20uc a day in widgets meaning that they need to have 4 build scheduled going at once to full utilise their ability. Am I reading this right? 1. You can make an Engineering Skill roll and use the result -15 is uc of widgets a day. With 5e's flat progression that would generally track less than 5 uc though. 2. You get to add +1uc for each TL your engineering kit is above the item you are making. That would generally not add more than a few uc though. I understand why the uc cap was used as you don't need to include DCs, but 5-10 uc per days still seems unnecessarily restrictive, especially as you still need the total widgets as well. Maybe allowing (5 x Engineering Skill roll -15) uc (min 5) may be a better way to go to allow real whizzes to make the most expensive devices. Any word on this? Would be good to know before we star our campaign. Your forum at http://www.diasexmachina.com/Forum/ is messed up. PHP errors. Magic quotes problems. This is preventing registration. The image for the code will not display. The forum is slowly being phased out (like WOTC did). Our Facebook page (search under Dias Ex Machina) is a much better location to keep up to date. Page 175: where is the Medic's 5th level Primary Target ability? It seems to have been omitted? Starting at 1st level, if you don’t make an Attack action on your turn, you gain a +2 bonus to AC until the start of your next turn. At 5th level, this bonus increases to +3. Could you clarify--is this a stand-alone rule book that uses the 5e framework, or are the 5e core books required?